Salmon is the common name for several species of fish of the family Salmonidae . The fish is pink and silver. Several other fish in the family are called trout . Salmon live in both the Atlantic and Pacific Oceans , as well as the Great Lakes and other land locked lakes. Typically, salmon are salt water fish. anadromous : they are born in fresh water , migrate to the ocean , then return to fresh water to reproduce . However, there are rare species that can only survive in fresh water habitats. This is most likely due to the domestication of these certain species of Salmon. Folklore has it that the fish return to the exact spot where they were born to spawn. The red colour of salmon is due to a pigment called astaxanthin, naturally occuring carotenoit and present in their food items. In cultured fish it´s usually added to the fishmeal, otherwise the animals would be white. salmon weighing approximately 1.5 kilograms at maturity. 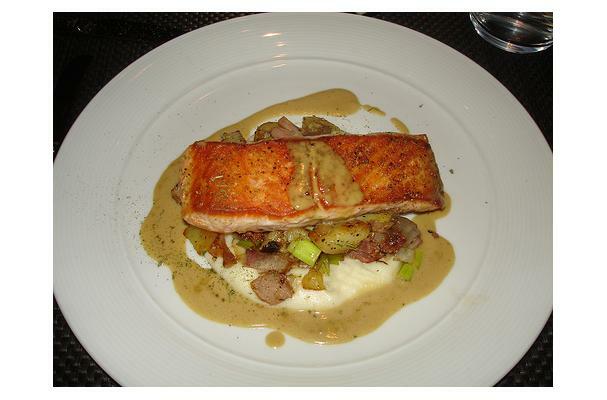 Choosing: Wild salmon tends to be a bit leaner and has an overall richer, gamier flavor making it generally the more desirable premium product, but pricing and availability in most areas favors farm raised salmon as the more economical choice. In making the choice, if it is available at your local market, you can consider whether the purchase is for a special occasion or an everyday meal. In every situation though a good cut from a farm raised fish is more desirable than a wild cut on the verge of spoiling. Buying: Buy from local Market and get it fresh, be sure to cook same day. Procuring: Fish farming involves raising fish commercially in tanks or enclosures, usually for food. A facility that releases juvenile fish into the wild for recreational fishing or to supplement a species' natural numbers is generally referred to as a fish hatchery. The most common fish species raised by fish farms are salmon, carp, tilapia, catfish and cod.